WHATS THE BEST WAY TO GET RID OF MOLES? WHAT ABOUT USING MOLE BAIT? There are at least 12 genera of Moles in the world and the United States has at least 5 of them. 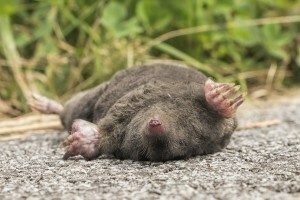 The most common is the eastern or garden mole. This mammal has a pointed snout, rudimentary eyes, soft velvety fur, broad feet and long powerful claws on it’s front pair of legs. Moles are a nuisance around the home and garden because they dig tunnels just below the surface of the ground. These tunnels seem never ending and will cause damage to grass and shrubs. They are on a never ending quest to find food and this will lead them to yards where insect and worm populations are high. Are you seeing destructive raised mounds appearing in your yard? Are they quite extensive traveling throughout the entire lawn with no clear goal or intent? And do they seem to appear overnight? These are most likely due to a foraging mole. No doubt homeowners have long been frustrated and infuriated with the damage these small yet persistent creatures will do. It is not uncommon for them to cause damage to all types of turf including Bermuda and Fescue. Moles are cursed with the need to feed throughout most of the day. In fact its estimated most will spend 20+ hours a day searching for food. Now what do they consider food? Grubs, worms, insects and some plants. In the garden, they will routinely tear through the root systems of plants and flowers as they forage. This in turn will cause the affected plant to die. Although considered to be insectivores, moles have been found to like certain root systems common plants in the garden have to offer. We believe that many plants are killed by moles which are feeding on insects nesting and living around plants and shrubs. This article will address how to control the insect population moles feed on and then offer suggestions on how to control the moles. 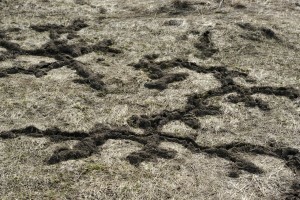 There are several ways to control moles burrowing through your turf. The list of options includes repellents, bait and traps. At the end of the day, the “easiest” method seems to be taking their food source away. Since moles are constantly looking for food, they’ll quickly move off your land if your turf doesn’t have what they need. In fact, most any insect moles like to eat will make noise and if its not the smell of the insects which attracts them, its the sound they make. For this reason it means doing some basic insect control will generally get rid of the moles. And if you do these treatments once every 2-3 months, you will help your lawn stay healthy and mole free for good. So whats the best way to treat the yard for insects? The general process includes applying granules and spray. True, there are several options available that can accomplish this task but the best for treating when moles are active is a combination of DEMAND GRANULES and CYONARA CONCENTRATE. Of all the treatments for turf, these two seem to work the fastest. No doubt they’ll work quickly on active insects. But the active is also highly irritating to moles. So once in the soil, the active will bother the digging mole by bothering its sense of smell and irritating its senses. This sensation combined with the reduction of insects will cause them to forage elsewhere so in most cases treating your yard will yield positive results in a week or less. To treat with both, you’ll first want to apply the granules. 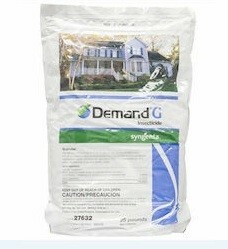 Use 3 lbs for every 1,000 sq/ft of turf; the 25 lb bag will cover up to 8,000 sq/ft. Be sure to apply some to flower beds and mulch areas too. Renew monthly until all mole activity is gone. After that, treating once in the spring and once in the fall will keep them away for good. Apply the granules with a good GRANULE SPREADER. Next, spray over the top with either CYONARA RTS or CYONARA CONCENTRATE. 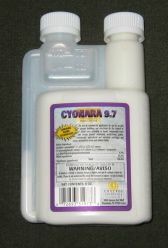 Cyonara RTS is the concentrate packed in a sprayer. Basically one quart will cover up to 16,000 sq/ft and all you have to do is hook it to your garden hose and its ready to spray. 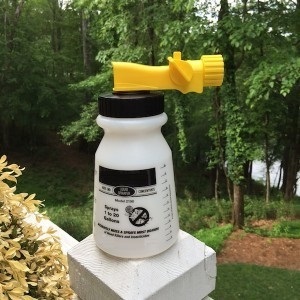 Use this once a month after applying the granules; after that once in the spring and once in the fall will usually keep insects under control so the moles don’t return. If you have a large lot to treat, get the CYONARA CONCENTRATE. This form goes a lot further and will prove more cost effective in the long run. 6 oz will cover an acre so if you have 1/2 acre or more to spray, this will prove more cost efficient. To apply the Cyonara, use a good HOSE END SPRAYER. If you get our unit, you’ll need to add 1.5 oz of concentrate to the sprayer and then enough water to fill it to the 10 gallon line. This is about half way full and enough to treat 1/2 acre. If you decide to use a mole bait, remember it must be placed in a tunnel you know they’re using. This can be tricky and tough to find since 95% of the tunnels they make they never use again. Remember, mole tunnels are dug as they seek food. And though they may have a “main” section or “run” where they like to rest, it can be far from the problem area. In fact it could be on someone else’s property since moles will routinely forage up to an acre from home when looking for food. To try and locate their main nest den, you need to “tamp down” or step on sections of the tunnels you find in your yard to see if any are pushed back up. This will happen in tunnels they using on a daily basis. And if you can find a section where this happens within a day of being compressed, bait it with MOLE BAIT PELLETS. This formulation uses insects as the main attractant which means moles will readily find it and consume your offering. The attractant also has ground worms in the mix. They seem to like it’s taste because we have seen good acceptance of this bait afield. Now like most any bait on the market these days the active will not kill the target animal for several days so don’t expect instant results. The rule when baiting active tunnels is to bait them once a week and then after a week, tamp down the tunnels again to see if they get pushed up. If they do, bait again. To bait thoroughly, apply a teaspoon every 10 feet in tunnels you see them re-using. Each 1 lb jar should be enough to treat up to 1/2 acre. To apply the bait, you only need to make a tiny entry hole from above just large enough to pour the bait down into the open tunnel below. If possible, laying some lawn litter over the top of the tunnel to help conceal the opening will insure the bait doesn’t get contaminated and that the mole doesn’t get spooked. If you have open dens and tunnels throughout the yard with deep tunnels or holes, you’ll need to get the bait down out of sight. Use a SNAKE BAITER to place the bait down 2-3 feet. This device is easy to use and will help get the bait well away from the surface which will insure fast acceptance and less chance of it getting noticed by some animal above. If you don’t have much of an insect population and believe the moles are targeting earthworms, go with TALPIRID BAIT. These are essentially “rubber worms” which have been impregnated with an active that will kill moles in a few days after they feed. Like the bait pellets, you’ll only get positive results if you apply the worms to tunnels being used for nesting and not forage tunnels. The big advantage of this bait is that it looks and feels like the real thing to a foraging mole. In our experience, moles will readily accept this form and can’t resist grabbing any they find. Each worm has the length, shape and feel of a real worm so when found by a mole, they won’t let it go. If you aren’t getting bait acceptance using the insect based Mole Bait, Talpirid is the next best option. The last bait option comes in syringe and is essentially a gel. 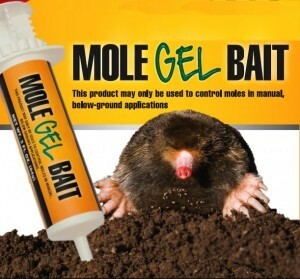 MOLE GEL BAIT uses both worms and insects as attractants. Because of its form, its hard for any mole to resist tasting some. The other advantage of this form is that its very easy to apply. You only need a small port hole on top of an active tunnel. Using this hole you need to “inject” the 1/2 oz dose down into the tunnel. Each 3 oz tube will provide 6 placements. Like the other baits, these placements need to be done in active tunnels so be sure you’ve identified which ones are being re-used. Each tube should be enough to treat up to 1/4 acre and one dose should be enough to kill 3-5 moles. For many people, trapping moles is the most logical way to proceed and no doubt this method has been done the longest in pursuit of controlling this pest. There are many models available today but the two traps which have proven most effective throughout the years is the old SPEAR TRAP and the newer TUNNEL TRAP design. The Spear Trap resides above ground; the tunnel trap is underground when set and again, like the bait, both need to be deployed over and in active tunnels. So if you’re more of a traditionalist and prefer to have your trap visible so you can tell when its been activate, the Spear Trap would be the design for you. This trap sits above ground and though its hard for anyone to be hurt by it, some people feel its both unsightly and presents an attractive nuisance to children and non-target animals. But over the years, this trap has probably caught more moles than all the others combined. Use as many as you want; in general the more set out, the higher the chance of success. But just like the bait, if the trap is set over active tunnels you should get a hit within a day. If you prefer a more “discreet” design, go with the MOLE TUNNEL TRAPS. These are placed down inside active tunnels and have small wood dowels which serve as both anchors and locators. Tunnel Traps are more economical and overall, the most common choice of professionals. Set one trap every 15-20 feet and inspect them daily. The key to getting success with this trap is to make placements of two traps set back to back so no matter which direction the mole comes from, he’ll surely have to enter the jaws and in turn, get caught. Like the spear trap, the more you employ, the better your odds of having success. Though trapping moles is usually the fastest and surest way to control unwanted activity, it is not always easy. However, once you identify where a nest or den may be located, your chances of success will be greatly improved. 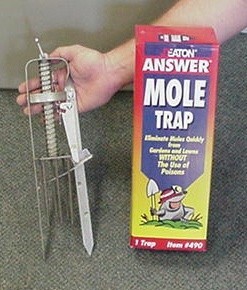 It is also suggested that Mole Bait be used in any tunnels just in case. Since the bait is so inexpensive to use we always recommend it along with the use of traps. This approach helps to insure success sooner rather than later before they’re able to do more damage to grass and plants. Another repellent worth considering is “sound”. 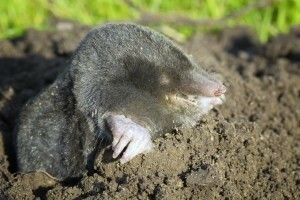 Ground burrowing animals like moles will avoid dirt under construction or subject to ongoing “noise”. For this reason, devices which intentionally send out sound waves can be used to both chase off moles and keep them from entering your lawn. So will they work? Absolutely. But you need to commit to them meaning you’ll need to set up enough to ensure your moles don’t just move to another area where no sound can be heard. But we have two units that have proven to work at chasing off active nesting moles and for preventing moles from coming onto your land. 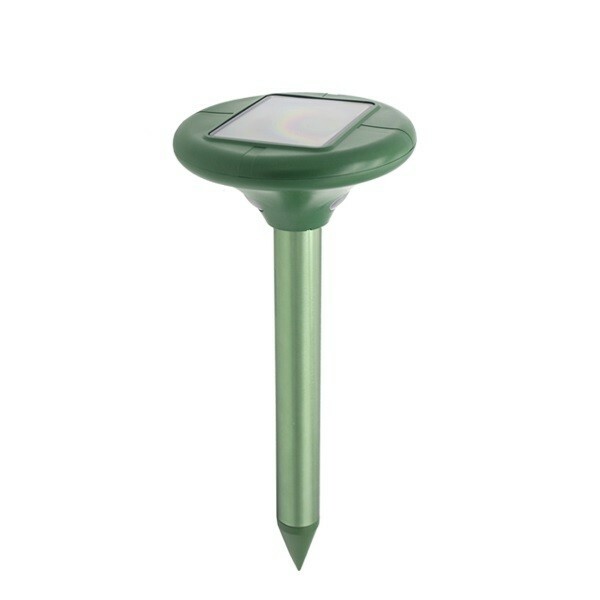 So if you have an active mole problem and want to make it as unpleasant as possible for the local population, install a SOLAR POWERED MOLE CHASER. This device uses sunlight to charge a small battery which in turn will keep the unit running through the night. In fact it can run several days without sun so once installed, you’ll have 24 hours a day protection. This unit can cover up to 6,500 sq/ft and if placed in the middle of an active mole infestation, it will chase them off. Results won’t happen overnight; it will usually take 1-2 weeks for them to clear out. And once they’re gone, we suggest you line your property borders with more units so moles won’t forage back. So first plan on using one repeller centered where moles are most active and then get enough to line the yard with them so moles that leave won’t come back. Units should be spaced 50-75 feet apart and they need to be set in the ground deep enough so the top is just 1-2″ above ground. 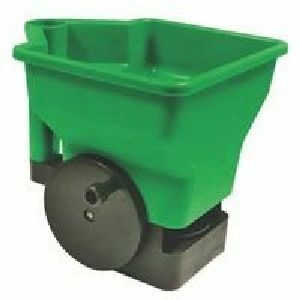 These units are made with heave gauge plastic and will last many years. But they only emit a vibrating sound wave. For maximum control, consider our DELUXE MOLE GOPHER SNAKE REPELLER. This model is essentially the same in that it uses the sun to charge an on board replaceable battery so it runs on its own, around the clock. And it too releases a vibrating sound that will “rattle” moles so they want to leave. But this model also incorporates other sounds making them well suited for a range of animals. As stated, this unit will vibrate several times a minute constantly rotating its cycle. But it also sends out “ultra sound”. In general, ultra sound won’t help fight moles since they’re down in the ground and well protected. But if you have ground squirrels, chipmunks, gophers, voles or even snakes in the area, this unit will stop them from coming around too. In addition to the ultra sound being sent out, it also uses LED bulbs located just under the controller head which emit an “evil” looking light at night. Small animals who like to forage on the ground will see the lights and perceive it to be a predator which in turn will make them uncomfortable and nervous. Combined with the ultra sound, the vibration and the audible sound, the deluxe repeller is powerful enough to keep your yard free and clear of most any ground dwelling animal. Be sure to prepare the ground properly before installing either unit. This means drilling a hole the proper depth and width. 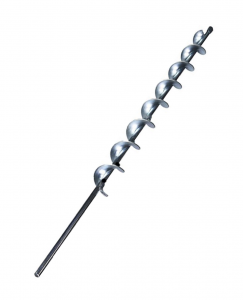 Our SOIL AUGER is designed for the task. Simply attach it to your favorite hand drill and take it out to the yard for the task at hand. Holes can be drilled in 10-20 seconds and be just the right width and depth (about 9 inches deep and 1.25 inches wide). In summary, there are several ways to deal with local mole infestations. The best way is to first apply some Bifenthrin Granules and then spray over the top with Tempo. At this time you should also push down tunnels to try and learn which ones pop back up indicating main dens. At least a day following the spraying you can apply some Mole Bait no further than 10 feet intervals down into the tunnels trying to make these placements where you have seen tunnels pushed back up. You should also set out some traps. If you don’t get them quickly with the traps you should be able to kill them off with the bait. Within a growing season or two you should have killed off enough of the insect population so that local moles will have to go elsewhere to find food. If you want to make sure they don’t come back to your yard apply some Whole Control over areas you want to protect. The Sonic Sound Chasers can also help and since the work around the clock, they can help provide a uniform barrier through which moles won’t want to pass. Did not read anything about any of these ideas being harmful to birds. I have bird feeders and this is where most of the mole damage is done. Sorry for the confusion; in fact none of these treatments or suggestions pose a hazard to birds which is why it’s not mentioned. But since you brought it, these treatment options are safe for use around pets, people and other animals as well as the local environment. I’ve used milky spore for the last two years and thought I might have the problem under control but this year the moles are back. I notice you do not mention this treatment in your Mole Control instructions. Why? We have not seen using Milky Spore will help much compared to the products listed above. Now if you don’t have any mole problems but want to treat for grubs for preventive maintenance, Milky Spore can be considered. But if you’ve got a mole problem, go with one of the control measures explained above as you’ll get fast results and minimize damage.